The flying buttress was among the most visible advancements in masonry construction made during the Middle Ages. This combination of external buttressing arch and supporting masonry tower transformed the exterior and underlying structure of church architecture in much of western Europe. However, while flying buttresses and their massive supporting piers were almost innate parts of thirteenth- and fourteenth-century churches and cathedrals, they appear only very infrequently on other building types, such as episcopal palaces, cloisters, or castles. Differences in function explain the lack of flying buttresses on residential and military architecture, but at the same time remove them from the more universal and flexible vocabulary of architectural forms and construction patterns shared between secular and religious projects. This paper addresses the apparent distinction between secular and church architecture around the turn of the thirteenth century as marked by flying buttress use. I argue that while flying buttress systems remained largely restricted to the domain of ecclesiastical architecture they were nevertheless part of a larger architectural trend in which walls were increasingly conceptualized as structural curtains punctuated by regularly placed reinforcements. Thus, while church and castle walls took very different forms, they shared a similar organizational pattern based on the idea of point support. These parallels suggest a further, and perhaps conceptually deeper, interconnectivity between secular and religious building practices that reinforces previously identified borrowings of visually similar features. This paper considers Bishop William of St. Calais’ chapel at Durham Castle in relation to his patronage at Durham Cathedral. 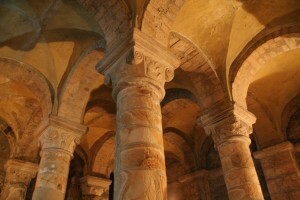 The chapel, although contemporary with the cathedral, is of completely Norman design that most closely resembles the eleventh-century crypts of Normandy, with their thin columns and historiated capitals. This is in stark contrast to the cathedral, which embodies a fusion or hybrid style employing a Norman elevation with robust Anglo-Saxon proportions and decoration. A synthetic analysis of these two structures has not previously been proposed, despite the dynamic environment in which they were built. Given the extremely close proximity between castle and cathedral (just 500 feet), we must imagine Durham’s natural peninsula as a large and lively building site during the last decades of the eleventh century; the masons were undoubtedly aware of the design of both sites, and likely would have worked at both. The builders were clearly capable of executing diverse architectural styles based on the demands of the patron, although they were probably of predominantly Anglo-Saxon extract. Although the bishop’s public project makes prominent use of Anglo-Saxon motifs in a Norman architectural framework, in his private chapel he maintained his native architectural proclivities. In this paper I draw attention to Bishop William’s intentionality in the conception of his architectural projects. Drawn together, his castle chapel and cathedral clearly communicate that the bishop was acutely aware of the political value of appealing to the indigenous population and their saint in public, even though his Norman identity permeates the style of his private chapel. The castle of Toruń, along the bank of the Vistula River in northern Poland, is the earliest castle built by the Teutonic Order in the region of Prussia. Constructed in 1231, the castle is one of the finer examples of the red-brick gothic style architecture that the Order introduced to the region. The castle possesses elements of both a military fortress and also those of a monastic cloister, particularly in the cells of the brothers which line the inner courtyard of the castle. This feature, borrowed from examples in the Holy Land, offers the possibility for investigating the new forms of architectural innovation brought to the eastern Baltic by the Teutonic Order and their crusading expeditions of the thirteenth and fourteenth centuries.This paper explores innovations brought to the region by the Teutonic Order, one example being the Dansker tower that is a prominent feature of the Teutonic Order’s castles in the region. The Dansker is the main latrine of the castles, and the example at Toruń is one of the better ones in the historical region of Prussia. In terms of the stone and brick building technology used in constructing it, the Dansker is a demonstrative example of the ways that the castles of the Teutonic Knights in Prussia were important centres of technical innovation. Toruń and its Dansker tower provide the framework for the arrival of brick castles in Prussia, and are the driving themes of this paper. The rebuilding of the monastic complex at Glastonbury, England after the fire 1184 presented the authorities of that community with the opportunity to engage both the local people and traveling pilgrims with new visual experiences. After the fire, the re-erected buildings showed peculiar features found in form and content specifically that of the Lady Chapel, the first structure to be rebuilt. Approximately fifty years earlier William of Malmesbury authored Glastonbury’s chronicle, the De Antiquate Glastonie Ecclesie, which served as the primary historical authority on the abbey. Malmesbury’s text coincided with the end the great period of land reclamation and technological development of the larger marshland area controlled by the abbey. Interestingly, it is through the re-erected Lady Chapel that analysis of how the medieval topography relates to not only the composition of the abbey’s rhetorical history, as conveyed in the De Antiquitate, but also how the intersection of the abbey’s program of environmental construction shaped the formation, use, and thus understanding of its most important building, it new stone Marion Chapel. Central to the rebuilding of the sacred structures was the employment of a specific aesthetic and cultural rhetoric of saintly and mythical lordly foundations. The subsequent proliferation of several of the community’s holdings provides insight into the reasoning behind the specific choices made regarding construction and sculptural ornamentation. Significantly, these buildings also exemplify the importance of the propagation of ideas surrounding Malmesbury’s created history as integral to understanding the developed cultivation of the landscape- not only of the power of the sculpted landscape mimicked in the monastic structures, but also the power of the monastic custodians. Analysis of the cultural story transmitted through the building and elaboration of the Lady Chapel demonstrates that its specific form functioned to recreate Glastonbury as a center of immense power and influence throughout the monastic network of England. The combination of the geophysical topography of the area’s marshy lowland setting and the multiple locations of fresh water springs and wells, as well as the particular color of the environmental rhetoric conveyed in Malmesbury’s record of the abbey’s pre- 1184 history, dictated not only the location of the Lady Chapel, but that its ornamental detail be configured in such a way as to construct a particular experience that would have been understood by the viewer as reflective of his or her relative place within that geo-rhetorical setting.